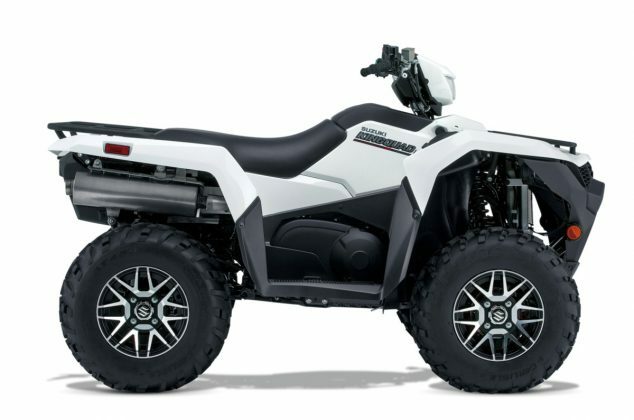 The MY19 KingQuad 750AXi Power Steering Special Edition is not just a new ATV, it’s a new KingQuad ATV from Suzuki, the inventor of the 4-wheel ATV back in 1983. The Special Edition model features new edgy and dynamic bodywork in an exclusive Snow White colour scheme and cast aluminium wheels shod with 25-inch Carlisle tyres. Revisions for MY19 include updates to the fuel-injected engine and the Quadmatic™ transmission help the KingQuad take-off from a standstil stronger and smoother than ever before. The updated, stronger frame, helps the KingQuad 750AXi tackle just about any riding terrain while being able to help you with any chore thanks to a boosted 600kg towing capacity. Steering has never been easier with a new, higher output Electronic Power Steering system and recalibrated front end geometry. The fully-independent suspension is fitted with new, gas-charged shock absorbers that feature 5-way pre-load adjustment to match the spring rate to the cargo load.